Description: This guide introduces the complex new edition of the Nestle-Aland Novum Testamentum Graece, 28 Edition, explaining its structure, the text-critical apparatus and appendices, and the innovations of the new edition. Citation: Michael W. Holmes, review of David Trobisch, A User�s Guide to the Nestle-Aland 28 Greek New Testament, Review of Biblical Literature [http://www.bookreviews.org] (2015). 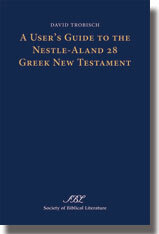 Citation: Jan Krans, review of David Trobisch, A User�s Guide to the Nestle-Aland 28 Greek New Testament, Review of Biblical Literature [http://www.bookreviews.org] (2015).